HomeCelebsPriyanka Chopra wishes her 'boss babe' Sophie Turner good luck for her show! 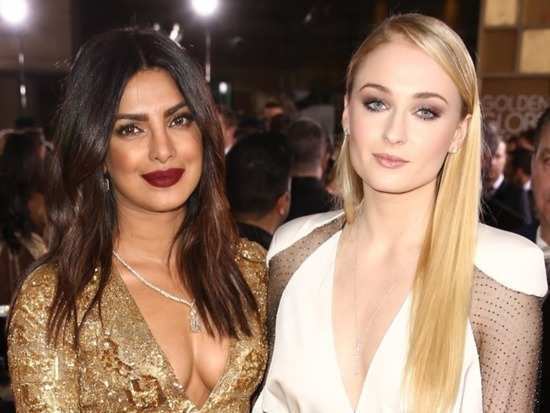 Priyanka Chopra and Sophie Turner share a rather wonderful relationship. The two have been best buds pretty much since Nick and Priyanka started dating and have been giving people some serious BFF goals. They're always praising and appreciating each other and if that isn't the purest form of friendship, we don't know what is. Sophie Turner recently made her return to a much-acclaimed show that has been the talk of the town for ages. Needless to say, people have been waiting with bated breath for the show's latest season to air and even more so to watch Sophie on-screen yet again. And while everyone was super excited for the episode to air, on the eve of the show's return, Priyanka Chopra took to her Instagram handle and put up a rather sweet and funny post for Sophie. In the photo, Sophie can be seen sitting on a throne and Priyanka hilariously photoshopped her pet dog Diana into the picture alongside Sophie. She even wrote a sweet caption for Sophie which said, "Good luck Sophie, you are a boss babe. And are very loved." Now, isn't that just adorable? Well, we're sure we can all agree that Sophie is indeed a boss babe and we can't wait to watch her on-screen ourselves. Meanwhile, Priyanka wasn't the only one who had some fun with Sophie's return to the show. The Jonas Brothers decided to join in and put up their own photoshopped pictures. The trio is seen sitting on three thrones with the word 'Cool' written behind them. They wrote, "Had to do it. Winter is upon us." ‘Cool’ also happens to be the name of the new single by the Jonas Brothers. So, we can say the picture seems to be quite apt. While we had hardly gotten over the ‘Cool’ thing, Joe decided to take things one step forward and tried to do a rather hilarious cosplay from the show. Well, we sure love how crazy everyone is going over this. Stay tuned for more updates. 1Priyanka Chopra wishes her 'boss babe' Sophie Turner good luck for her show! 10The ‘Kalank’ trailer is out and we’re convinced it’s more than just a story of eternal love!